During production and inspection of components with optical data transmission, it is important to align fibers or fiber arrays for optimum connection with the highest possible accuracy. Position tolerances way under 50 nm are usual and multi-channel inputs require alignment in several axes to optimize coupling of the input and output arrays. PI (Physik Instrumente) already has two high-precision photonics alignment systems in its range that enable several fibers to be aligned in only seconds. Both systems are based on a very stiff design that consists either of three stacked linear axes (F-712.MA), or – if rotary motion is required – a parallel-kinematic hexapod (F-721.HA) combined respectively with a nanopositioner. 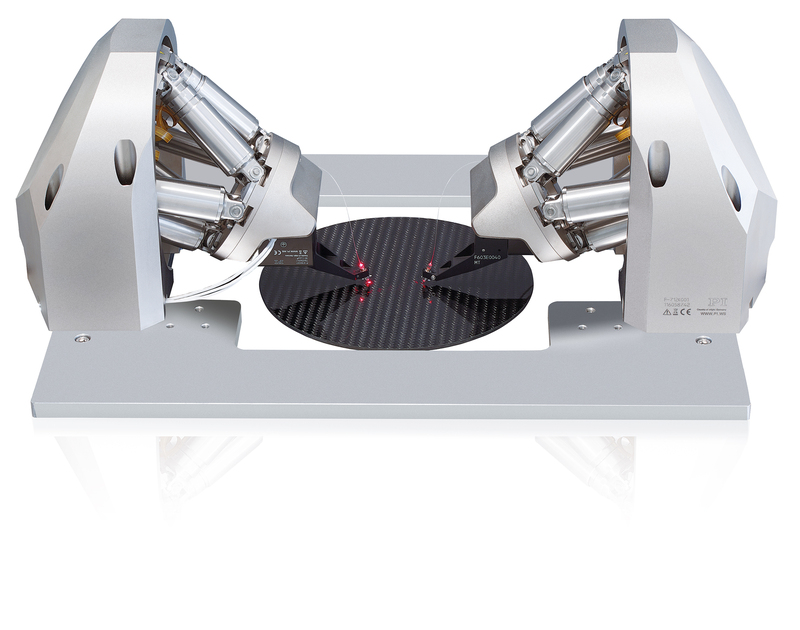 The parallel kinematics and the stacked axes with their motorized drives enable longer travel ranges of a few millimeters for coarse positioning, and at the same time, the NanoCube® positioner ensures fast scanning motion and dynamic compensation of drift effects. Flexure guides and all-ceramic insulated piezo actuators guarantee a long lifetime. Position sensors on all drives prevent collisions, for example, with an expensive silicon wafer. Both systems are available for either single-sided or double-sided positioning tasks. The scope of delivery includes a high-performance digital controller (E-712), firmware routines with algorithms for very fast positioning, and an extensive software package. 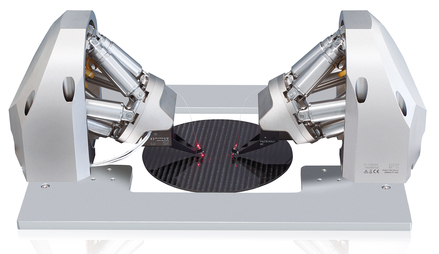 The matching hexapod controller (C-887) is also supplied with the parallel-kinematic set-up. The stacked system for positioning fibers or optical components operates in all three axes for coarse positioning with travel ranges from up to 25 mm at a minimum incremental motion of 2 µm, and a maximum velocity of 20 mm/s. The hexapods travel ranges in the X, Y, and Z direction are ±6.5; ±16 and ±8.5 mm, and for the three rotational axes at ±14.5, ±10, and ±10 degrees. The minimum incremental motion is 0.1 µm respectively. The system operates at a maximum velocity of 10 mm/s and can delicately position the user-defined center of rotation (pivot point) at any point in space, even at different angles, for example, when positioning fiber arrays. The NanoCube®, which takes care of the fine positioning for both systems, operates with travel ranges of 100 µm in all three axes and a minimum incremental motion of 2.5 nm. The positioning time for area scanning over 100 µm x 100 µm is under 1 second at a maximum deviation of the peak intensity of 0.02 dB. Well known for the high quality of its products, PI (Physik Instrumente) has been one of the leading players in the global market for precision positioning technology for many years. PI has been developing and manufacturing standard and OEM products with piezo or motor drives for more than 40 years. In addition to four locations in Germany, the PI Group is represented internationally by fifteen sales and service subsidiaries. Next post Ocean Optics Referral Program – Receive a Gift Card Valued at up to $500!